CMS Cepcor continually invests in the latest state-of-the-art inspection and material testing technology in order to set the standard in quality assurance. CMS Cepcor precision services operate CNC turning centres complete with driven tooling capable of high-accuracy and heavy-duty machining of large, heavy and long components up to 5000mm in length and supporting a workpiece up to 8,900 Kgs between chuck and tailstock. CMS Cepcor precision services is a leading source for the manufacture of 'OEM' original equipment manufacturer components and spare parts used in heavy engineering. CMS Cepcor manufacturing facilities include high capacity CNC milling, turning, boring, slotting, grinding and drilling alongside welding, hydraulic pressing, hot assembly, FARO co-ordinate measuring and SPECTRO material testing. CMS Cepcor precision services operate CNC machining centers capable of handling componets upto 4800mm long x 1000mm wide x 1500mm high and weight capacity of 10,000 Kgs. Incorporating Baguley Precision our locomotive support services include tyre replacements (de-shrink and re-shrink), re-gauging wheel sets and manufacture of complete new axle assemblies. CMS Cepcor precision services manufacture a wide range of complex shaped components to suit a variety of applications. CMS Cepcor manufacturing technicians ensure every component that we manufacture complies with the correct dimensional tolerance prior to final inspection by our quality team. CMS Cepcor precision services are experts in the manufacture and repair of mainshaft assemblies to suit large gyratory crushers used in mining and aggregate production. CMS Cepcor precision services have gained valuble experience over many years in the sub-contract repair to wide range of heavy machinery components critical to customer production and operations. CMS Cepcor precision services operate remote controlled Demag overhead travelling cranes to improve safety and efficiency of moving heavy and often awkward shaped components. High capacity MultiSurfacer column | boom | turntable. Capable of welding components of 3000mm diameter and upto 3070mm in Y-axis (above the table height) and has a 700mm diameter bore with pit constructed beneath. 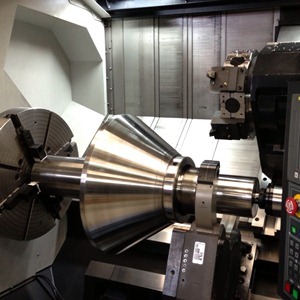 CMS Cepcor precision services operate vertical machining centres designed for heavy duty machining applications. CMS Cepcor precision services manufacture a wide range of UK cast and precision machined bronze bushings to exacting dimensional tolerance and material specification.